This week’s Tuesday Tip is all about different kinds of hooks: plain aluminum vs. ergonomic, inline vs. non-inline, and so on. There is no such thing as a perfect hook for everyone; everyone has a different preference, so it’s important that you try a few out for yourself and find out what works best for you! This guide is meant to show you the differences between several major types of hooks and help you figure out what it is you’re looking for in a crochet hook. 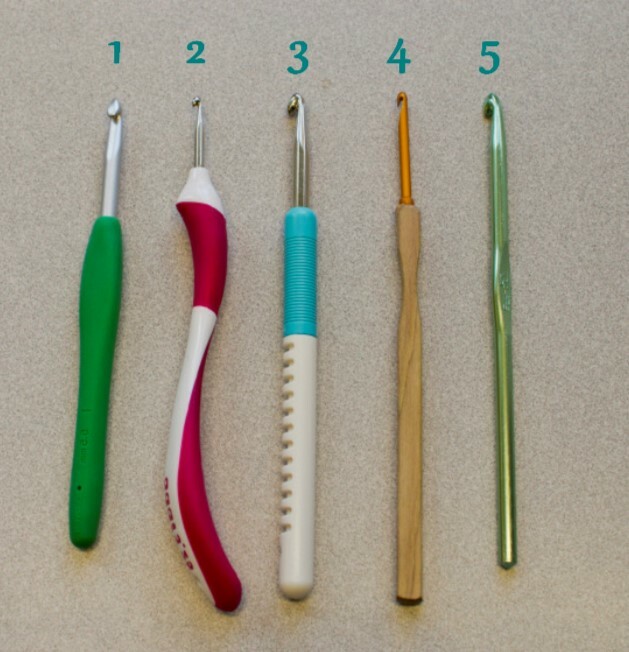 If you’re new to crochet, it is good to get to know the basic parts of a crochet hook before you pick one up. Throat – The throat of the hook is what catches the working strand of yarn and is used to pull the yarn through the stitch. The width of the throat of the hook is tapered, also to varying degrees. If you find you are constantly dropping loops as you work, you may want to find a hook with more of a taper; this allows for your yarn to sit neatly inside the throat of the hook and has a little more room. Grip/Thumb Rest – The grip of the hook is part of what makes each kind of hook so different from each other. Some hooks have a thin grip and corresponding thin handle, others have thicker grips and handles (these tend to be a little more ergonomic). The grip of the hook is also usually where the hook’s size is printed/etched/carved/burned/etc. Handle – The handle also separates the ergonomic hooks from regular hooks. Some are padded silicone/plastic, some are carefully carved wood, and others are simply unique in design. In-line hooks are basically a perfect cylinder from the head to where the shank meets the grip. You can think of it as a dowel that has had a notch cut out for the throat, but not a single bit of the dowel extends past the diameter of the shank. The same goes for the in-line hook–not a single bit of the shaft bulges in or out beyond the diameter of the hook. 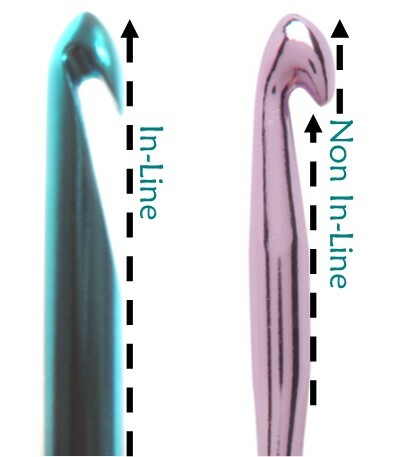 Non in-line hooks are basically any hook that isn’t an in-line hook, though there are hooks that are closer to in-line than others. These are often called “best of both worlds” hooks or “middle of the road” hooks. Below are two different hooks–a Susan Bates hook on the left and a Boye hook on the right. You can see how the diameter of the Susan Bates hook remains the same from the head to the shank, whereas the head of the Boye hook extends beyond the diameter of the shank. Both styles have their benefits, but both have their downsides. A middle of the road hook often takes the benefits from both styles, which is why the are so common and loved. Crochet hooks are often made of aluminium, plastic, or wood–and sometimes even a combination of materials! The important thing to think about is not only the material of your hook, but also the type of fibers of the yarn you plan to use with that hook. Smoother, silkier yarns, for instance, tend to slide off of plastic or aluminium hooks, so you may find that using a slightly rougher wooden hook more helpful. On the other hand, wool fibers may catch on the rougher grain of the wooden hook, resulting in snagged yarn (yikes! ), so you may want to choose an aluminum or plastic hook. Pro-Tip: the same goes for knitting needles! With all of that said and done, here’s a look at a few different types of hooks that I’ve used. I’ve ranked them from 1-5, ranging from my absolutely favorite (to-date) to adequate hooks. 5) Boye Aluminum Hooks – The Boye hooks are what I learned to crochet with, so they’ll always have a special place in my heart. They also come in a large variety of sizes, are found at several big-box craft stores, and are very budget-friendly–a big win in this crafter’s book! The Boye hooks are non in-line hooks with a slightly tapered throat and a (mostly) rounded head. The round head makes it easy to push the hook through your work, but doesn’t split the fibers. I find this makes it easier to keep a steady, quick pace while I work. However, they aren’t especially ergonomic. I have carpal tunnel syndrome in both my wrists, so I’ve sort of let these hooks fall by the wayside. I’ve also found that while my stiches are usually pretty tight, they are especially tight when working in amigurumi patterns–so tight that I’ve even broken one or two of these hooks mid-stitch! The plus side is that they are easy to find and inexpensive to replace. 4) Kollage Square Hooks – These hooks are wonderful and quite ergonomic in shape, and I have several of them. The unique design of the wooden handle makes it quite comfortable to hold, and I find that the grip is in just the right spot. The handle is also not so long that gets in the way of my hand but not so short that it bothers me. These are in-line hooks and come in both rounded and pointed head styles to suit your needs–a total bonus! The main problem I have with these hooks is that the shank of the hook does not extend all the way through the wooden handle. In fact, it is barely set inside the handle at all, and when too much tension is applied, the shank pops out entirely. This happened to my size D/3.25mm hook, which I use with all of my amigurumi patterns. I have heard of others having the same problem, and they’ve said that the Kollage customer service department was quite nice about it (sending replacement hooks and such), but that doesn’t really solve the problem. Mr. M. was crafty enough to put some kind (I’m not sure what exactly) of glue inside the handle and clamped it together to make it set nice and snug, and that worked for quite a while–maybe a few months. But it has recently come apart again, and now there is a bunch of glue residue inside the handle, too. Grr. That being said, I have other sizes of this hook, and I have yet to have that problem. My size I/5.5mm square hook has held up wonderfully, and I use it all the time. 3) Addi Comfort Grip Hook – The Addi Comfort Grip hook is very nice indeed. The thicker handle is excellent for my poor wrist, and the non in-line style is easy to work with. The head is also semi-rounded–a preference I think I’ve developed. The handle is a bit too long for me, though that isn’t my primary concern with these hooks. What bothers me most is that the grip on the handle is actually a kind of slippery hard plastic with some grooves cut into it, as opposed to a soft sylicone like I thought before I bought it. 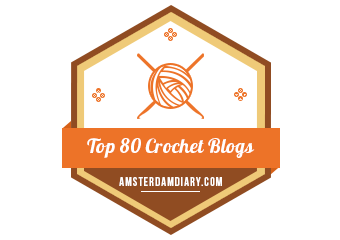 This makes it hard to hold onto for us knife-style crocheters. I think it would work well for those who hold their crochet hooks pen-style, though. 2) Addi Swing Hook – This is my second-favorite hook for a reason. Like the Addi Comfort Grip, this hook is a non in-line hook with a semi-rounded head. I particularly like the thumb rest on the grip, and the “swing” design of the handle is both comfortable in my hand and just the right size. It’s wonderfully ergonomic and much sturdier than the Kollage Square hook, especially when I use it on my amigurumi patterns. It takes a little bit of time to get used the “swing” design, but if you have troubles with your wrists like I do, it’s worth your interest. 1) Clover Amour Hook – The Clover Amour crochet hook is what I’d consider to be a “best of both worlds” hook–the head is rounded, the throat slightly tapered, and it’s almost an in-line hook (or just slightly a non in-line hook, depending on your philosophical bent!). The hook is in some kind of a matte-aluminum finish, which I’ve found works well for both slick and coarse fibers. The handle is also a great length and fits so comfortably in my hands. This is a prince of ergonomic hooks–I used it directly after using one of my Boye hooks, and the aching and fatigue in my wrist went away within minutes. It is equally suited to both styles of holding the hook, though I think the padded grip may be more effect for pen-style hook holders. This is my favorite hook, though I am anxious to try out the Clover Soft Touch hooks as well. Thank you for your informative guide to crochet hooks and insights as to your preferences. I have read so many posts from fellow crocheters who rave about Clover Armour hooks that I may have to buy some for myself at Christmastime. I, too, have wondered about the Clover Soft Touch hooks. I’m a knife-holding type of crocheter and wondering if the Armour or the Soft Touch style is better suited to my usage. Thanks again! The Amour hooks are wonderful! I plan on purchasing one of the Soft Touch hooks later today–I’ll let you know what I think!